Graphic Programming 2 - During Graphics Programming 2 students learn how to build a simple game engine (almost) from scratch, all through code of course. So no editor, no extra tools, it's all about understanding what you are writing. 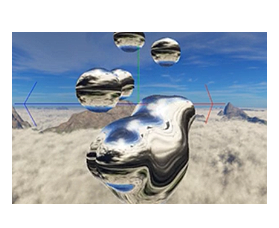 This in combination with frameworks like DirectX (Graphics API), Nvidia PhysX (Physics API), FMOD (Sound API) gives the student a robost framework that enables him/her to recreate a simple 3D Game. - Focus on code and technical implementations, less on art. > Again, these projects are pure (C++) code projects without using somekind of Editor Environment like Unity3D/UE4. GP2_1718_Mangelschoots_Jonas_Geom_Gameplay from Digital Arts and Entertainment on Vimeo. GP2_1718_Van_Bever_Ward_Bomberman_Gameplay from Digital Arts and Entertainment on Vimeo. GP2_1718_Masovitch_Denis_Bomberman from Digital Arts and Entertainment on Vimeo. GP2_1718_Demeester_Sven_Frogger3D from Digital Arts and Entertainment on Vimeo. GP2_1718_Vangrysperre_Aidan_JumpGirl from Digital Arts and Entertainment on Vimeo. GP2_1718_Wyns_Jeroen_Apocamino from Digital Arts and Entertainment on Vimeo. GP2_1718_Desmet_Cas_Overcooked from Digital Arts and Entertainment on Vimeo.